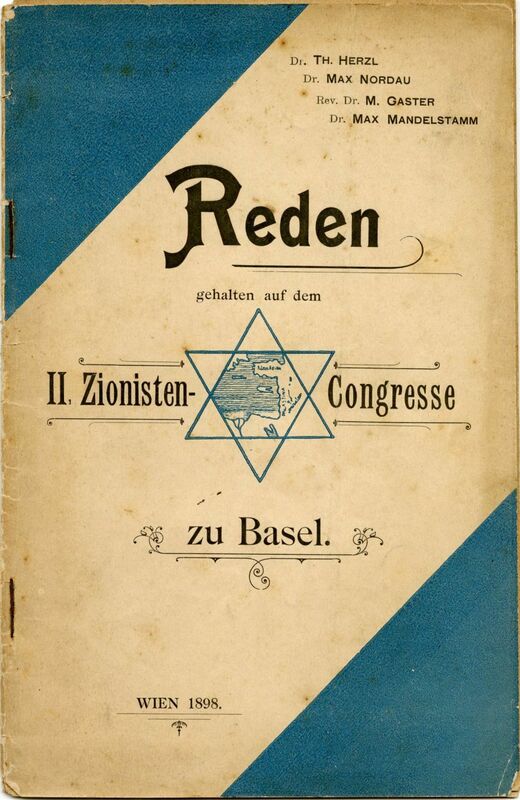 (Addresses given at the [second] Zionist Congress in Basel) - Vienna, 1898. Rare. Booklet in German with addresses by Herzl, Max Nordau, Dr. Max Mandelstam and Rabbi Moshe Gaster, chief rabbi of the Sephardic congregations in England, who was among the main speakers at the first Zionist congresses, and served as the vice president of the congresses. At this congress, the decision was taken to print and disseminate this booklet. Gaster's address was brought in this collection "due to the great impression made upon his listeners with its rhetorical beauty." On the back of the booklet: Verlag des Vereines "Erez Israel" ["published by the of the Erez Israel Association"].